Join us for dinner on the farm at 6:30 p.m. on Friday, September 28 or for golf at 8 a.m. on Saturday, September 29. Can't make it? You can still donate. Relive the memories of previous events in our photo galleries. 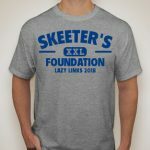 Since September 2010, Skeeter’s Foundation has raised over $100,000 for lung cancer research programs and patient support.